Antti Rinne is more complex than the image conveyed by the media. He develops in this exclusive interview for Finland Politics a strategy for the party based on participatory democracy tools, which is quite modern, and has a clear vision of Finland’s real challenges, with the idea that the problem is more about finding new market for innovative products than competing on salaries and costs with China or India. He is explaining why he critics certain government’s reforms, and expresses his worries about the political situation, as he considers that the government is an artificial alliance lacking coherence. He is however speaking regularly with Juha Sipilä and gives his point of view on the reforms and on the necessary evolutions. You have been a trade union leader, then suddenly you moved into politics. How does it feel? I have not had a very typical political career. I began with working in a sawmill, mainly driving trucks, before working some time later for a Finnish actor, Veikko Sinisalo, , who has been famous from the 50s to the 70s, starring in films such as the Unknown Soldier. I was Veikko’s driver, I was helping with the stage, and sometimes playing a small part. After some years of interesting experiences; I decided that I needed to study more, and I went to the University of Helsinki, at the Law faculty, where I got a Master in 18 months. It has been quite a challenge! After that, I have worked as a lawyer for ten years for the ¨Finnish Transport Workers Union”, before creating my own legal company, handling workers’ cases. At some point, I came back to the Trade Union movement, as the Chairman of ERTO, the Federation of Special Services and Clerical Employees, member of the Board of the Union of Salaried Employees TU, and then Chairman of the Board of PRO, the largest private sector union for clerical employees and the largest member of the Finnish Confederation of Professionals STTK. At some moment, some people were asking me if I wanted to consider being Chairman of the Social Democratic Party (SDP). I had been in the party since I was six years old, in the youth organisation! In 1982, I really joined the party and was very active at the local level, for example as secretary of the local section of the SDP. So I have been in the party for more than 30 years. But it was really not easy to decide if I was going to run for the party’s presidency: I had been working so long for the trade unions, and I enjoyed it, working with like-minded people, which is always good, and getting results in our work. But at that moment, I was very scared about the situation of our party. I run for the chairmanship and was elected. What was the most important for me, what I wanted to bring to the party, was to better connect its militants and its decision-makers with the Finnish citizens. And that is the main thing I need to do now. There are major differences between the life of a chairman of a trade union and the life of the leader of a party. For example, the biggest surprise for me was the way media are handing politicians, in Finland and I suppose elsewhere, and how difficult it is to have them deliver your message to the public without distortion, which is quite stressing at certain moments. Another surprise for me, was that when became Minister of Finances, I worked on normal days from 5 am to 11 pm, and generally 7 days a week, in order to lead the party and be an efficient minister. Now, it is still interesting, but slower by comparison. What are the issues making the party go down? We have been initially a movement for citizens more than a party, and we should go back to this notion. When our party was created, we made a programme, called the Forssa programme, adopted in 1903. And there was a number a objectives in this programme, such as the 8 hours working day, the right to vote for all, the principles for building the social and healthcare security system, and the education principles, everything which in fact has been implemented in the last 100 years. Then, in the 90s, we had an important economic crisis, as we have now. It was a bank crisis, many people had no resources, and the unemployment rate went over 20 %. 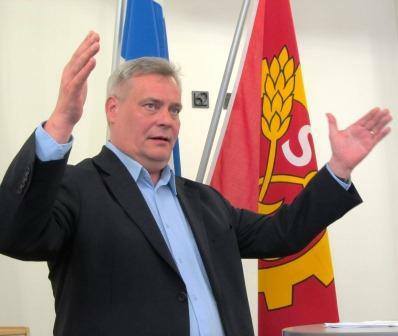 The SDP won the elections when Paavo Lipponen was the Chairman, and then he made decisions which may have been justified, but were opposed to our members’ ideas. From that time, we have lost in some way our values, we became political decision makers who decide without thinking about our founding values, just trying to be realist. For example, at the municipal level, we have now 1 700 party members who are political decision makers, and they discuss items such as routes or health centres, but they do not consider how to put in practice our values such as freedom, justice and equality. There are no deep discussions between the citizens and our party militants, or even inside the party about those values. But what is it to be a politician if you forget the core values which should be the base for our actions and decisions? For me, that is one important reason why we have lost the support of the people. For example, I feel that we should not let to the right side the concept of freedom, which was one of our founding principles. The right wing are saying that you need the freedom to do what you want, which is an empty concept: we in fact need to have the freedom to have education, the freedom to have security, the freedom to access to the health system, in the same way that we needed at the beginning of the 20th century the freedom to vote. The difference has to be better explained. Another issue is the fact that, in 1995, there were 80 000 members in the party, they were working and active and paying their contribution to the party. There was a limited number people not in active life, such as pensioners. Now, we have around 40 000 members, and almost half of them are not working. For the elections, we had a good campaign, but it was a campaign made by old people. It was the first time that I saw, in Kerava, an old lady bringing coffee with her Rollator. I never saw that before. So we have not been successful to attract new people, young people, into the party. I am also convinced that there is the issue of the slow disaggregation of the Finnish industry. People who are supporting us come from the workers’ side, they are working or they have been working in the public sector, such as in municipalities, and in the industry. Finland has lost 150 000 jobs in the industry since 2000, and a good share of our members was coming from this sector. We have to adapt to this change. For example, we have been very keen on speaking about organisations and institutions, for example about the reform of our social and healthcare system, the SOTE reform. We say that it is necessary that the public sector is in charge of these organisation of the production, and the private sector should only take the activities where there is no reason to use the public sector. In Tornio, I met Leena, a lady who is 72 years old; she had a serious health issue, and she has tried to get an appointment with the doctor for 3,5 months without success. It was not helping that I explained that we have a really good healthcare system, and that we need to trust this system. In fact I should have said: sorry, there is something wrong and we need to change the system, and in the short term we will help you to get an appointment with the doctor in the next days. It is not helping to discuss the institutions, let’s concentrate on finding practical solutions for the problems of the people. That is the main change that I have to promote in the party. There is a specific issue with the young people, and it concerns all parties. According to the researchers, there is a risk that in 2030-2040, we are in a situation where in Parliament elections the voting rate would be a little bit under 50 %, when it is a little over 70 %. Young people are not interested in voting for the parliamentary elections, and that is a very big issue in the Finnish society for the future. How will you get more young people in the party? We need to talk about and do things which are important to them. It is not sufficient to say “We are the best party, come to us”, we need to do something that creates the trust between young people and the party. One thing we need to change in the party is the idea that people should come and stay active in the party from the start to the end. Young people are more interested in practical projects, they would be ready to come with us for 6 months, to work on something important to them, and then leave to come back later when something else interests them. We need to listen and create these projects. I have tried something similar in my own municipality. In 1994, I was member of the party in Mäntsälä, we decided to let the people talk about what was important to them, and we just listened. There is a river going through the city centre, and people were talking together about the need to do something, because the surrounding of the river was really dirty, there was waste and garbage there. We organised a discussion, and a little more than 60 people came to talk about the problem. We had asked them to take their boots, we walked together by the river and we made a list of what we needed to do. After that meeting, we made a proposal at the municipal level about what we need to do, and our municipality did it. After that, 6 or 7 people among these 60 people were candidates at the municipal election. I think that these 60 people got the idea that the social democrats did something for them, addressed their concerns. And this is what we need to do, listen more and act on people’s real issues. In addition, I am convinced that people really appreciate to be asked about what should be done. I was with Stefan Löfven (the Swedish Prime Minister) going from door to door during the campaign, and I saw that people were glad that we were coming to ask their opinions. Some told me sometimes that they were going to vote for the Centre Party, but they said also: “it was very nice of you to come and ask us”, and that relation between the citizens and our militants is the main thing to develop. It has nothing to do with stay one Saturday near the doors of a supermarket and to give free sausages, with always the same people coming to say the same things. The majority of people do not come to take these sausages, they walk through and do not discuss with us. We need to make these conversations happen! So we certainly need to think about how we are discussing, what we are discussing, where we are discussing, and how we integrate our values such as justice and equality in our discussions But we need also to discuss the same topics from the municipal level to the state level and arrive to a common view. For example, we do not accept for the moment at the national level the system of vouchers to give to citizens to get access to services, but in some municipalities our party members have decided to use this type of method for delivering the services. So we have an opinion here, and another opinion there. That is because in 20 years we have never have this kind of collective discussion, which is rather strange. When I was elected, I wanted to have a strategy, and build it through meetings involving a large number of our members. We got a little more than 1 400 people involved to prepare our programme. I am very proud of this paper, and the participants were very happy about it. And I think that is the way to have a good support: when people are asked about the party they would most likely vote, we are not in a good rank, but when in the polls people are asked which other party they could vote for, we are number one, and the level of this support has been fast growing in March and April. But it proves that our reputation is improving, and it comes from the fact that people say that something is happening in the party. We have to continue! We have a long tradition where the trade unions, the employer’s organisation and the government sit together and make agreements concerning the wages, and the main reforms such recently as the reform of the pensions’ system. The government has now decided to bypass this process, and I think that this attitude put our society and our economy at risk: our method has been until now successful, because it is better to arrive to an agreement on how to improve Finland’s future, with everybody pushing in the same directing, instead of having expensive conflicts which are undermining the country’s confidence. That is why Finland has been so successful since the last war. That is why I criticised the government’s so-called social contract or agreement. It is neither social, nor an agreement, when the government tells you:” you need to do this, you need to do that, or else I am going to retaliate by punishing you and the Finnish population. They are not proposing, they are requiring that the employees work 100 working hours more a year without additional salary, or that the salaries go down by 5 %, or that action should be taken concerning the pensions costs, which are in fact basically financed by employees’ wages, not in fact paid by employers or the government. All these three requests from the government are not acceptable for the trade unions members because we have had already three times very low level of wages increase in the collective agreement, we have agreed on difficult reforms of the pensions’ system, it does not seem to have helped, and now, in addition, people should accept to work more or cut in the salaries in addition to the existing sacrifices, without discussion? In addition, it is unrealistic and inefficient. Statistics show that we are working a little under 40 hours per week, but the real situation is that there is grey work, there are a lot of cases where people are paid for a certain number of hours and they do more, because they like their work, they like their company or their organisation, and in the health system they want to do more for patients. So when we discuss the working time, we should consider and discuss the real situation, and it is not possible when the government demands or orders: we need a discussion, we need a negotiation considering the whole situation and then we would have more chances to obtain some results. About productivity, my feeling is that there is a major misunderstanding. As a trade union member, in 2013, I was visiting 162 companies, and I have seen everywhere possibilities to increase productivity. For example, in some companies, I saw that there were products kept outside in the cold, and then it was necessary to bring them back to the production line 30 minutes because they were frozen! There are a lot of small things like that which are limiting the productivity. In addition, there are a number of sectors in the industry where the machines are used only less than 70 % of the time, not 100 %. If you want to increase productivity, it does not make sense to make people work longer hours, it is common sense that you need to them produce more products and services during their working hours. But now, what we see is this 30 % gap where the machines are not used. So I do not see the logic of the government. And for competitively, there are in fact not so many people outside Finland wanting our products. We have lost 55 000 jobs in the electronics sector between 2008 and 2011, mainly because of Nokia; we have lost 65 000 jobs in the machinery industry from 2008 to 2012, and we have lost 35000 jobs in the forest and paper industry between 2000 and 2012. The reason is becoming clear: other countries can provide today products at lower or at the same price with the same quality, and sometimes a better quality than us. Whatever sacrifices we make, we cannot compete in the field of prices with China, India or Pakistan, so we have to think quality and innovation. We particularly need to focus on innovations taking into account the world’s mega-trends. The Centre Party has sometimes spoken about our know-how in the field of the valorisation of forests. But I I think also that clean water is becoming more and more important in the world, and the demand for new technologies in this field is increasing exponentially. In the same way, clean water technologies are needed. In these fields, we in Finland can be competitive in terms of technology in the long term future. We have the skills to do that kind of thing, we have the possibility to develop innovations in this sector, but we lack a strategy involving the school system, the research sector, and the support for innovation in our society. We will have a better future if we have such a strategy, and make things according to this strategy as fast as possible. So it does not help as much as the government if saying if we continue in vain to fight the economic war on prices only. If you look at our successful competitors, wages are going up in Germany and in Sweden, and they are doing quite well! Let’s work on an export strategy based on the mega-trends in the world. Have you regular contacts with Juha Sipilä? Are your exchanging on these topics? Yes, we are discussing a lot, I have at least weekly contacts with him. Have you seen an evolution on his thinking? I think that it is not a coherent government. There are difficulties with the True Finns. There are issues on which they have decided to act like an opposition party, not as partners in the government. For example about immigration. There may be also difficult times when the Greek situation is developing. They is also the intervention of Jari Lindström, Minister of Justice and Employment, who indicated that the government should apply some pressure on the employers’ organisations, which is different from what was agreed in the government’s programme. When I discuss with the True Finns Parliament’s members, they have not yet understood what kind of decisions were agreed in the government’s programme. In particular, they have not realised yet that families are going to lose yearly 1 500 euros per child, that retired people are going to lose in average 55 euros per month, or the level of the cuts in education. When they will realise it, there will be huge difficulties in their party, and also in the Centre Party. The whole line of the government programme has been written by very right-wing Centre party people and Kokoomus, and that is a problem. What about the work with other opposition parties, such as the Greens and the Left Alliance? We are going to have a meeting soon, where we will discuss on how we will create this opposition work together, but I have said to them that I do not want to make compromises on our positions. I want to make clear to the citizens what our party’s position are. We are not now going to make a list of things on which we agree, we are going to try to feel what the situation between our parties is. With the Left Alliance and the Greens, it is easy to discuss on most of the topics, but with Christian Democrats or the Swedish People Party in Finland, there are more differences in the economic domain, and with the Christian Democrats we have not the same positions on such topics such as gay marriage… So it is more an exploratory discussion than the constitution of an organised opposition. We discussed the social agreement. What are the chances that the government proposals are agreed in August 2015? First, these are not government’s proposals, they are government’s demands. And if I understood correctly the trade unions’ reactions, they indicated that the starting point should be similar for the employees’ and the employers’ organisations. Now, it is not, there is an imbalance: if there is no agreement on this so-called social contract, the government is going to impose budget cuts affecting the population to the level of 1,4 billion euros and the sanctions on employers would be around 1 billion euros only. From the trade unions’ point of view, it is not an acceptable starting point. So at the end of August, it will not be the end of the negotiations on the social agreement, it will be the end on the discussion on the starting point of these negotiations. And if the government is not agreeing on changing the balance of sanctions in case of an absence of agreement, then there will be no negotiation. But I am not the leader of trade unions, it is just a guess. If the negotiations take place, we cannot expect the conclusions before autumn 2016, as in terms of calendar it has to be in phase with the renegotiation of a new wage agreement, which should take place next year. One last question: if you had to give one main recommendation to Juha Sipilä, what would it be? I would say to him that it would be clever to take into account the long history of social relations and negotiations in Finland, if he wants to create the conditions for a better Finland.